It's time to pack up and go back home for another Wakandan Christmas which means attending lots of celebrations. Of course, there's a holiday parade in the kingdom you're looking forward to attending (you do every year) and there will be lots and lots of caroling. Mostly Wu-Tang songs, of course. (Wakandans are huge fans of the RZA, the GZA, and the Ghostface Killah.) T'Challa will wear a Santa Claus suit over his Black Panther disguise and pass out gifts to all the children while Vibranium is assembled into opulent decorations. If you thought a tinsel-adorned tree with sparkling ornaments was breathtaking, you should see a Christmas tree bedecked with Vibranium. It's 10x more impressive than the tree in Rockefeller Center! If you ever get a chance to travel to Wakanda for the holidays, we recommend wearing the adult Marvel Black Panther ugly Christmas sweater to get the most out of your Wakandan Christmas. 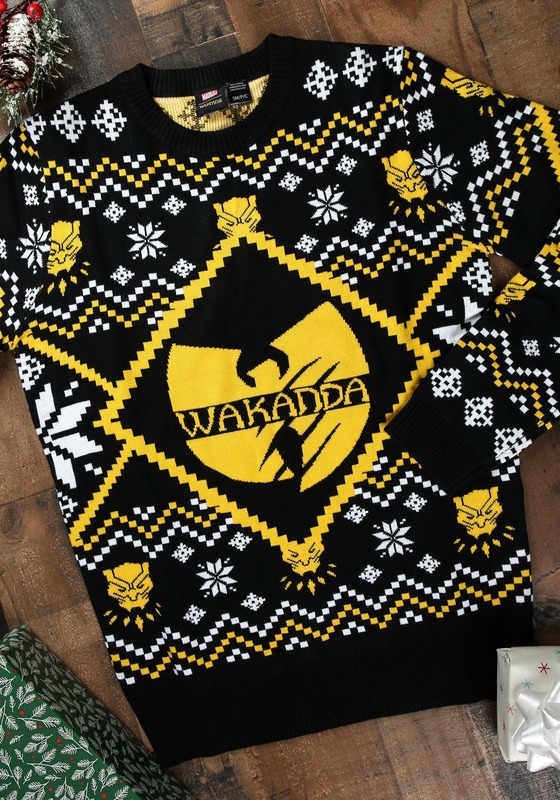 This sweater is an official collaboration between hip-hop's most influential group and Marvel's Black Panther. The knit sweater has an intarsia pattern with a black, yellow and white color scheme featuring snowflakes, dots and Black Panther masks. A rib-knit neckband, sleeve cuffs and waistband ensure this sweater is fitted yet comfortable. Marvel and Wu-Tang together? Yeah, it's going to be a very merry Christmas this year.